Protection of the public, and private entities against loss, injury and criminal damage. To value our customers through delivery of the best service possible. This will be achieved by concentrating on Shield Security Services Limited core values, which will enable the sustained growth, and main the success that has been achieved. Demonstrate a commitment to safety, environment and social responsibilities. Being open and honest and acting at all times with integrity and transparency. Embracing diversity and inclusion, enhancing leadership, team work and involvement to engender a culture where staff are loyal and both ambition and talent are nurtured. Achieve high performance, results and an innovated programme of continual improvement. Create sustainability long-term commercial partnerships with customers, employees, suppliers and greater community. Existing owner of all businesses is actively involved. Recruitment of a senior experienced security executive in each business already in place. Strategic business and marketing plan for all three business areas. Effective targeting across all areas of the businesses sectors. Quality systems, policy and procedure fit for purpose to achieve best practice. Fair recruitment, selection and onwards employee advancement. Remuneration to attract high calibre workforce. Rewarding success through employee recognition scheme. Full administration support from head office. Good open communication with the employees by the Leaders to set the tone and direction of the business. To establish Shield Security Services Limited as the preferred leading independent provider of Security solutions in the market. Our clients’ success is our success; we seek to create and maintain lasting relationships based on trust and shared objectives. Shield Security Services adopts a proactive approach to security issues. We stop potential issues from occurring in the first place and limit the damage caused when unavoidable problems arise. By using security management techniques, such as risk analysis, we target and reduce the threat of crime and loss. Shield applies Manunta’s diagram to all its operations. 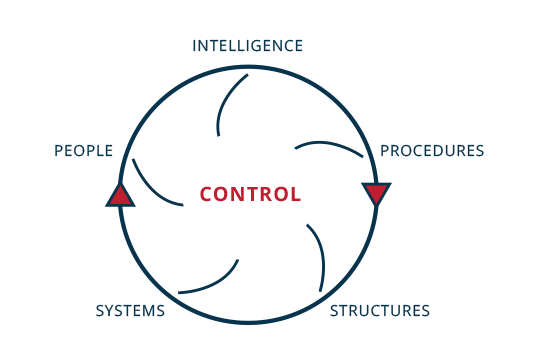 Manunta’s diagram of a security system is designed to create a well-protected and safe environment, through the adoption of effective management activities. Since incorporation, Shield has been an advocate for the training of individuals in the security industry. All Shield’s staff are experienced and highly trained and Shield offers a range of security training for the wider community. Security trainingSecurity consultancyContact us to book your free, no obligation, security evaluation today!